The Green Parking Lot serves as a demonstration of the various practices that can be used to reduce the environmental impacts of conventional asphalt parking lots. The parking lot design features several low impact development (LID) practices, including permeable pavement, rain gardens, bioretention areas and infiltration trenches. By providing opportunities to infiltrate stormwater, these technologies help to remove pollutants, replenish groundwater resources and reduce the risk of flooding and stream channel erosion. 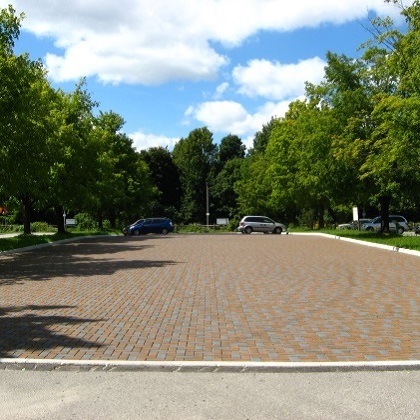 In addition to stormwater benefits, the lot also demonstrates the use of green construction products – like recycled rubber pavers – and the use of shade trees to keep the parking lot cool and reduce the urban heat island effect. These shade tree islands also help to reduce stormwater runoff volumes by intercepting and evaporating rainfall. The native vegetation planted in the rain gardens provide resilience to drought, improve the site’s aesthetics and offer valuable habitat for pollinators. In total, there are four permeable pavement testing sites on campus. Two of these sites are constructed with permeable interlocking concrete pavers with varying joint spaces, one is constructed with pervious concrete and the fourth is constructed with permeable interlocking recycled composite pavers. Not only are these permeable alternatives as strong as conventional types of pavement, but when properly installed and maintained, they can last for over 20 years. This Living Lab is set up to allow for the measurement of water quality, flow rates, volumes and water temperature through subsurface drainage from each pavement plot, the infiltration trenches and the rain gardens. Maintenance needs are also evaluated and the results are used to inform practitioners of the frequency and level of maintenance necessary to make these practices successful.